Bite the casino chilli in the second installation of this spicy 5 reel that is filled with free spins and great cash rewards. Pull on your poncho and travel to Mexico in this fiery online slot and the reap the red-hot rewards that we know you deserve! For nearly 15 years, Lightning Box has been delivering mathematically ingenious entertainment to the land-based and online casino market. Founded by mathematicians, they keep their clients happy by keeping their customers engaged with unique slot features and innovative gaming concepts. Get ready to don your sombrero again and head for Fiesta – as Lightning Box has returned with a sequel to Chilli Gold. 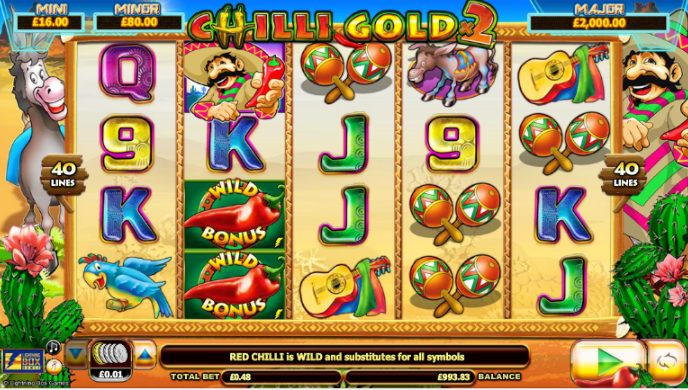 With 4 rows, 5 reels, and 40 pay-lines, Chilli Gold 2 is the way to win in the otherwise arid land of the Mexican plains. With cool, quirky characters, fun graphics, and the exceptional mathematics of Lightning Box at its core, this online slot sequel is packed with entertainment. From £0.40 to £60.00 per spin, we can see what the symbols hold for us, whether it’s the lower value 9 through A playing cards, the Spanish (or probably Mexican) guitar, the pair of Maracas, the cheeky Parrot, the charming Donkey, or our host – the chilli-brandishing Mexican; now even spicier than he was in the first game! The Chilli itself is simultaneously the Wild and the Bonus of symbol of the game and will appear Stacked on reels 2 through 4. In theory, it is possible to end up with a screen practically full of Chilli’s, but at least 6 are required to start triggering the Free Spins feature (and for each one on top of this, we will trigger another 3 Free Spins). There are more great slots promotions here. All wins during the Bonus round are doubled, and a Bonus Chilli Gold symbol will also appear in the feature. With the regular Wild also being the Bonus symbol and appearing stacked, once the Free Spins feature is reached, the wins suddenly start to pile up. A standard Gamble feature can also be activated after any win, with a guess the suit or colour game giving us a regular opportunity to either double or quadruple our wins. 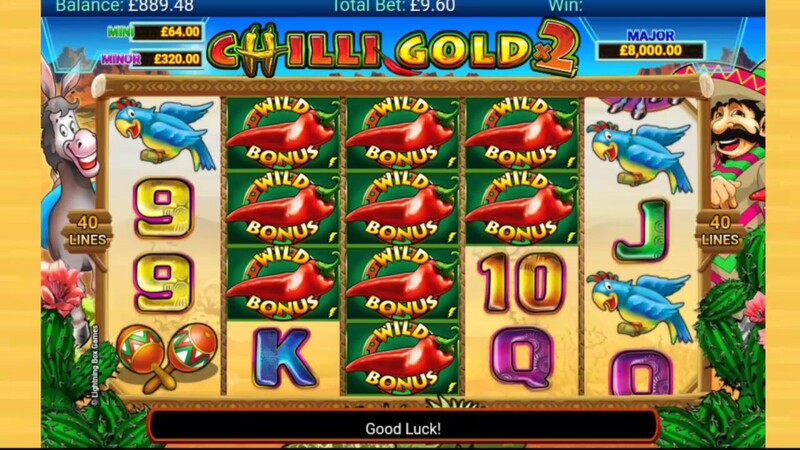 Chilli Gold 2 also features a Jackpot Game, which is played on a different screen and gives us the chance to head for the ultimate jackpot – a 1000x coin bonus. There are several lesser prizes also available here, so once we’ve triggered the feature, we’re looking good for a significant win returning our way, after working our way up a progressive ladder game, and shooting down ships to reveal winning symbols in the final round. A huge part of the theme here is backed up by the audio; the Mexican music that resonates after every victory is wonderfully catchy, and with the regularity of the Chilli wins being so frequent, we’re sure to hear this music often! Lightning Box has got the theme of this online slot spot on, with characters, graphics, and audio combining to create a cool (but spicy!) Mexican sensation. With the chance to go for a grander reward in the Jackpot game, and the variety within the Free Spins feature, there’s certainly getting bored in Chilli Gold 2! 9/10. Now try our famous Irish Eyes slot.